Improvements to the customer review process - Which? It’s now easier than ever for your customers to leave reviews on the Trusted Traders site. Here’s how the new process works. Your customers will no longer have to log in or register to write reviews, thanks to improvements to our website. We’ve listened to feedback from traders and customers and have streamlined the process to encourage more people to leave reviews. All reviews will still be moderated, and customer contact details will be collected to help us check the comments are genuine. Get a profile for your business on our website, where customers can review your work when you become a Trusted Trader. Your customer will first need to find your profile on our website. They can search for you on the homepage, or they can use the blue ‘Leave a review’ button found in the top right of most of our webpages on desktop, or within 'Menu' on mobile and tablet. This also opens the search bar or shows them the traders they’ve looked at recently. 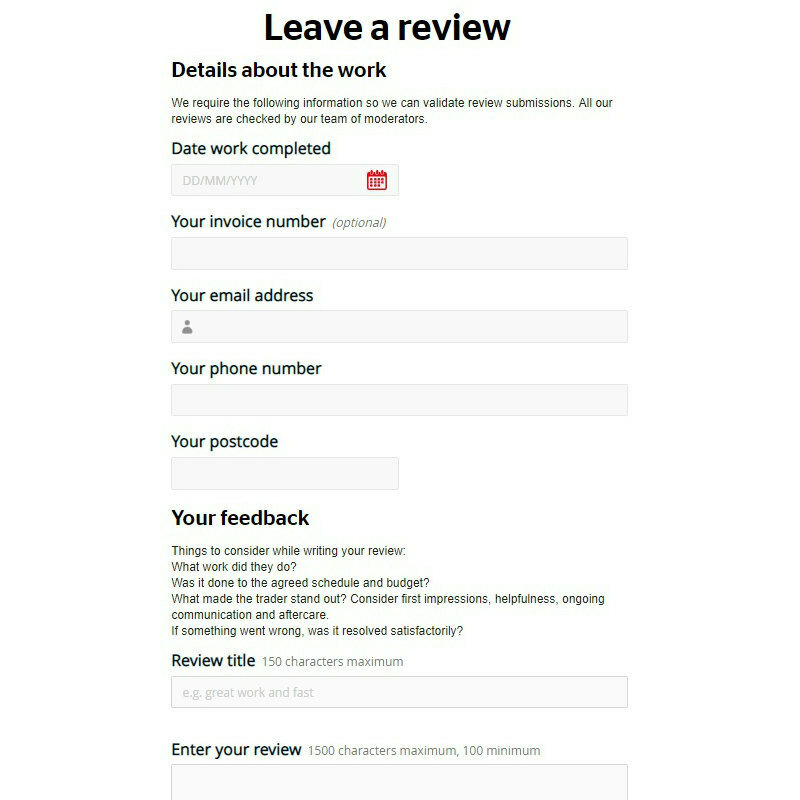 Once they’ve found your profile, they can use the ‘Create a review’ link to open the review form. Customers will then see the review form, shown below, which first asks for contact details so we can verify the review. They can then enter their comments and ratings as normal. You’ll still get an automatic email when a customer has reviewed your business, to help you respond to reviews more quickly. You can encourage your customers to leave reviews by giving them review cards with the website details when you finish a job.